Have you ever robbed a casino? No, nor have I. But after visiting the Heliot Steakhouse at The Hippodrome, I found the outstanding value enough to make most anyone feel like a member of the Rat Pack in Oceans 11. Quite honestly, I had my doubts about the restaurant before visiting. Although having heard nothing but praise, my partisan preconceptions of the place included an unsavoury concoction of Leicester Square, men in polyester suits vaunting their wealth while supping dry martinis (shaken, not stirred – obviously) and yaffing food with a vulgar whiff of TGI Friday’s. I absolutely hate being wrong, but in this instance I’ll quite happily own-up. After passing a doorman who speaks like an extra from Lock, Stock and Two Smoking Barrels, a dimly lit corridor leads through to the main floor of the casino. Here, a compendium of roulette wheels and blackjack tables look as though plucked straight from Las Vegas and can be seen from the first-floor restaurant. After squandering a few notes on one of the venue’s many roulette tables (in the name of research, of course) we head to the restaurant for dinner. On the surface, it is the land that taste forgot. Pillar box-red blanquettes seem as though salvaged from a brothel; black leather swivel chairs make me feel as though I’m at work, but they’re less comfortable, and the restaurant’s carpet is so jazzy, so discordant – it’s a wonder that Wetherspoon’s haven’t yet bereft them of it. We’re seated at the edge of the highest tier of seating, peering down on the rest of the building’s clientele and a number of hypnotic roulette wheels. What’s genuinely most surprisingly about Heliot, nonetheless, is the often incredible value of the food served – especially when remembering the proximity to the rest of Leicester Square’s frankly catastrophic restaurants. Alongside the main menu of mainly American-style dishes, there’s also a hot and cold mezze section, a 24-hour menu, weekend lunch and brunch, plus a pre-theatre menu at just £17.95 for three-courses. From the main menu, sea bass ceviche (£9) isn’t the finest example of beginner’s luck. Arriving on a glass vessel with a well for dry ice to noisily blare throughout the room, this is a dish that could be accused of favouring style over substance. The fish is undoubtedly fresh and sliced into paper-thin slivers, accompanied by equally thin slices of sweet golden beetroot, ginger and chilli that’s less spicy than acidic. There’s also a heavy-handed squeeze of juice so high in citric acid it’s impossible to distinguish and completely knocks the dish’s harmony. Far better, however, are three seared scallops (£10) which are perfectly seared, parading some golden caramelisation. These, too, are joined by a beetroot element. This rouge puree, however, is flecked with caraway which works in harmony with the beetroot’s earthiness. 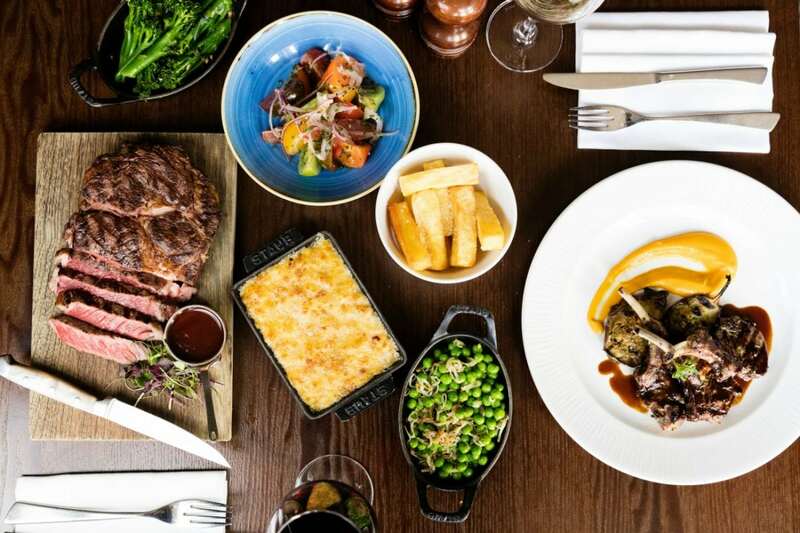 Main courses include a perfunctory burger, as well as the likes of slow-cooked duck breast, various lobster dishes and a vegetarian “spring garden pie”. As for the steaks, the menu is about as American as John Wayne riding a Cadillac Coupe De Ville along Route 66 while supping from a bottle of Bud Light. All of the steak served here is American USDA Prime beef, grain fed and aged for a minimum of four-six weeks. We select a 23oz (650g) T-bone that’s plenty for two and boasts extraordinary value at £30. To put the price into perspective, a similar cut at Smith & Wollensky – a New York-inspired steakhouse just off The Strand – costs £78 for 700g. That’s £7.80 per 100g, in comparison to the £4.61 per 100g charged here. For a full house: Hawksmoor charge a comparatively staggering £8.25 per 100g of T-bone. In addition to the the steak, we also select a topping of roasted bone marrow, béarnaise sauce, and porcini sauce. I’ve recently reported on the futility of ordering steaks within restaurants, but when said restaurant is marketed as a bona fide steakhouse – to order anything else would be absurd. Fortunately, this hulking hunk of cow is cooked perfectly: heavily charred on the outside with well-rendered fat and a centre that blushes like the Queen of Hearts. The béarnaise is fine, yet it’s the porcini sauce with it’s dank earthiness that really lifts this dish, as well as the lusciously fatty bone marrow that compensates for the lack of fat on the fillet side of the T-bone. On the side, we hit the jackpot with the ‘Millionaire’s Mac and Cheese’ which, you’ve probably gathered, does not call for diners to be millionaires to order. It costs £7 and is worth every penny. Classic tubes of macaroni and molten cheese are executed very well indeed, topped with teaspoons of ground black truffle paste and a poached duck egg with a yolk that bleeds in to the pasta to make a schmaltzy, insalubriously delicious mess. Finally, baked Alaska is ignited at the table and lends plenty of theatre, but feels completely unnecessary following such a vast quantity of meat. While the food served here isn’t necessarily the best in London, the whole experience is entertaining, even without the need to visit any of the betting tables – enticing as they may seem. It should go without saying that Heliot is Leicester Square’s best restaurant, as small a feat as that may be. But if, like mine, your gambling skills are laughable; you’ll find deep comfort in the value of the Americanised comfort food on offer at Heliot Steakhouse, at the very least; with absolutely no need to break the bank. Heliot Steakhouse can be found at The Hippodrome Casino, Cranbourn Street, London WC2H 7JH.